Introduction: Recently, a number of studies have investigated the impact of fluoride concentration of drinking water on dental fluorosis. These Studies should be reviewed to provide a new outlook on the analysis of the causes and effects of dental fluorosis in specific regions. The objective of this study was to systematically review the fluoride concentration of drinking water and investigate its relation to the frequency of dental fluorosis in Iran. Materials and Methods: Dean's index was used to classify data, and a meta-analysis was conducted to obtain summary measure with 95% confidence interval (CI). In this regard, Stata/SE 11.1 was employed for data analysis based on random effect models for reporting the results. 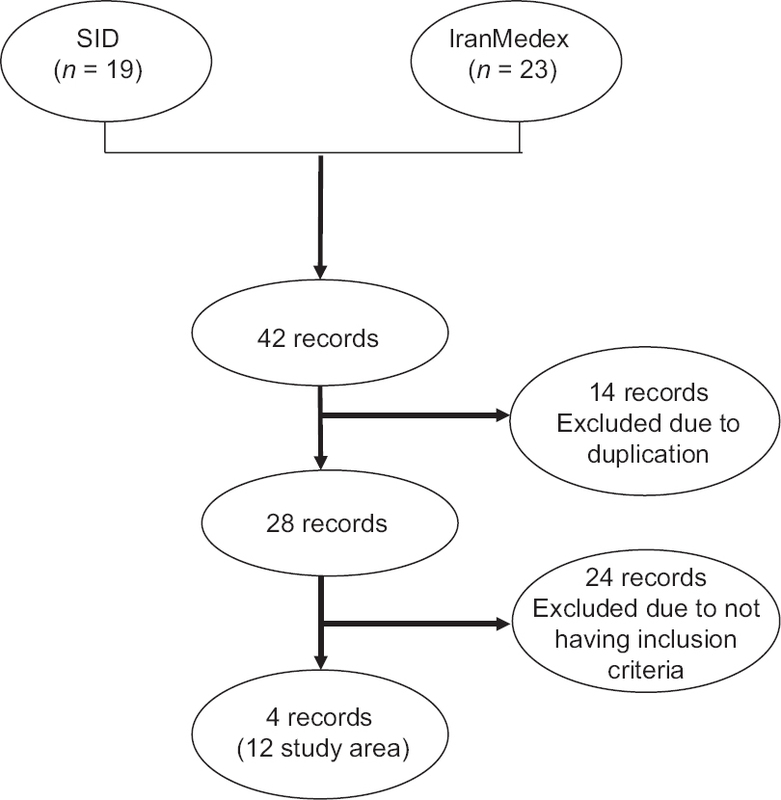 In this systematic review, Scientific Information Database (SID) and IranMedex databases were searched and studies were included based on specific criteria. Data validity was assessed using the strengthening the reporting of observational studies in epidemiology (STROBE) checklist adapted for cross-sectional study designs. Furthermore, a series of predefined keywords were used, and the combination of these keywords were considered using operators. The inconsistency was examined using the χ2 test at a significance level of 10%. In addition, heterogeneity was quantified across studies using the І2 statistic. The difference between study variance was analyzed based on τ2 statistic. Results: In the age group of 6-18 years old based on the fluoride level in drinking water and exposure time, there was significant heterogeneity among the studies in all subgroups for determining the frequency of dental fluorosis and assessing the effect of other variables. Conclusions: The variables, water fluoride exposure time, and any exposure to fluoride are considered as confounding factors. Analyzing the subgroups and examining the heterogeneity showed that the results of the studies in all subgroups cannot be pooled. Introduction: Bromelain, a mixture of proteases derived from different parts of pineapple, has been described to have therapeutic benefits in a diversity of inflammatory diseases. Such effects are associated to its proteolytic activity. As one of the most common and multifactorial diseases, periodontitis is a bacterial infection that results from the damage to the integrity of the tissues around the tooth, which includes gingiva, periodontal ligament, and alveolar bone. 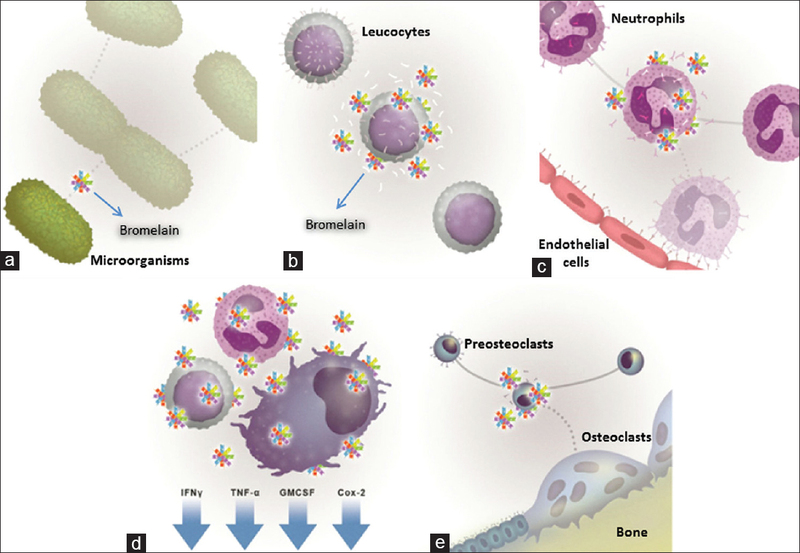 In periodontitis, the recruitment of defense cells occurs, which releases several pro-inflammatory cytokines. At elevated levels, they can potentiate the alveolar bone loss. Studies have been conducted trying to alleviate the damage to the periodontium, however, the regeneration of the periodontal tissues is still limited. 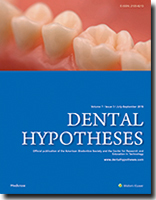 The Hypotheses: Based on previous studies showing that bromelain can act by decreasing the periodontal microorganism growth by proteolytically cleaving important cell surface molecules in leucocytes, by reducing neutrophils migration to periodontal sites, by downregulating the inflammation mediator levels, and by decreasing alveolar bone loss in the periodontitis. Evaluation of the Hypothesis: In a first moment, to evaluate this hypothesis, could be used two animal models: the ligature or bacteria inoculation induced periodontitis. If studies using animal models show encouraging results, appropriate clinical trials should be designed to evaluate the effect of bromelain as a complementary treatment for periodontal disease in humans, during the active phase or after the healing phase of mechanical therapy could be tested; to conduct a placebo-controlled study where health and periodontitis patients could be used. Introduction: TMD sufferers are not able to move their jaw normally. Several theories tried to demonstrate the relation between pain and movement in patients with TMD. The Vicious Cycle Theory (VCT) suggested that a sore muscle caused by prolonged contraction would lead to more muscle activity which would lead to more pain and a continuation of the vicious cycle. The Pain Adaptation Model (PAM) suggested that a decreased activity of a sore muscle responsible for producing movement is more likely in order to reduce speed and the detrimental effect of movement and promote healing. The hypothesis: The Hybrid model, developed in 2006, suggested that both the VCT and the PAM are valid and applicable in orofacial pain patients, depends on the origin of the pain whether from the muscle or from the joint. Evaluation of the hypothesis: The data from a study on pain and movement showed that both increased and decreased activities of masticatory muscles are possible in the presence of pain as the system reacts differently if the pain originates from the muscle or from the joint. In case of muscle pain, the data showed decreased activity of agonistic muscles during movement and this is conformed to the PAM. When the pain is in the joint, both decreased and increased activities were observed throughout the movement. Neurophysiological mechanisms that govern the relationship between pain and movement, as well as clinical manifestation of the pain, are different if the pain arises from the muscle or from the joint. Finding new treatment approaches that deal with the muscle pain and joint pain as two different entities seems to be of utter importance in orofacial pain patients. The Hybrid model could play an important role in this direction. Introduction: Periodontitis is a chronic inflammatory disease associated with a number of lung conditions such as chronic obstructive pulmonary disease (COPD) and pneumonia. Both chronic periodontitis (CP) and COPD share similar risk factor profiles. Thus, recognition of interaction between periodontitis and COPD could lead to establishment of better preventive and therapeutic approaches. The microbial analysis of sputum from COPD patients with CP to detect periodontal pathogen Porphyromonas gingivalis (P. gingivalis) both before and after nonsurgical periodontal therapy. Materials and Methods: The study group comprised 30 individuals diagnosed as COPD with CP. Periodontal indices, lung function test, and P. gingivalis in sputum were assessed before and 6 months after nonsurgical periodontal therapy. Results: A decrease in the count of P. gingivalis and decreased periodontal indices values were observed in COPD patients with periodontitis after nonsurgical periodontal therapy. Lung function test (forced expiratory volume in the first/forced vital capacity) was improved in COPD patients with periodontitis after nonsurgical periodontal therapy. Conclusions: The study results suggest that nonsurgical periodontal therapy can be a part of treatment protocol in COPD patients because it helps in reducing the P. gingivalis count and improving the lung function. Introduction: Foramen tympanicum is a normal variation of tympanic plate of the temporal bone which exists in the tympanic plate at birth time and will rarely remain open through adulthood. The aim of this research study is to assess the prevalence of this foramen in people over 6 years of age. Materials and Methods: In this descriptive-analytic planned cross-sectional study, cone beam computed tomography (CBCT) images of 159 patients (318 ears) over 6 in the Isfahan Province during 2015-2016 were evaluated. The foramen was detected in the axial plane and then was confirmed on the other planes. On each image, the location, size, and configuration of the foramen were studied. Patients were asked about the symptoms in case the foramen was detected. Finally, the data were analyzed using the Chi-square test, independent t-test, McNemar, Fisher, and Pearson correlation coefficient (P > 0.05). Results: A total of 159 images of the patients aged 6-78 years including 99 males and 60 females were studied, of which 11 patients (6.9%) had at least the foramen on one side. 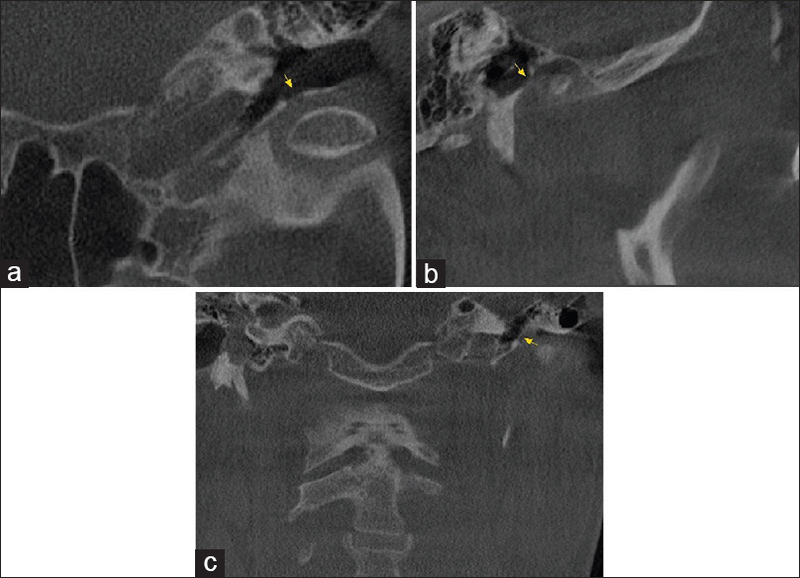 The foramen prevalence was symmetrical on both sides (5%), but the tympanic plate's thinning was significantly higher on the right side (11.3%) than on the left side (5.7%) (P = 0.04). The general shape of the foramen seemed to be oval when axial and sagittal diameters were compared. Statistical analysis indicated a negative correlation between patients' age and the foramen diameter (P = 0.03, r = −0.324). Conclusion: Using high-resolution CBCT images, the prevalence of the foramen tympanicum in people over 6 in Isfahan was found to be 6.9% and symmetrical in the two sides and in both genders. Introduction: The aim of this study was to evaluate the degree of pain and discomfort experienced for 1 week after miniscrew insertion using a questionnaire survey. Materials and Methods: Thirty-nine miniscrews were inserted in the mandible and maxilla of 33 patients with a self-drilling JB head type miniscrew under local anesthesia. Patients were asked to rate the degree of pain and discomfort experienced on a visual analog scale (VAS) after 1 hour, 12 hours, 1 day, and 1 week . Data were analyzed using the Statistical Package for the Social Sciences version 22 software. Repeated measures analysis of variance (ANOVA) with considering the jaw, side of insertion, and length of miniscrew as a between subject factor was used. Results: There was no significant association between the length of miniscrew (P = 0.448), the jaw (P = 0.870), and the side of the insertion (P = 0.346) and causing pain. The maximum degree of pain experience was in 1 hour after insertion that was 48.79 mm in VAS scores, which started to decrease significantly after 12 hours, 1 day, and 1 week as the minimum intensity of the pain was 1 week after the miniscrew insertion that was 2.31 mm in VAS scores. Conclusion: On the basis of the patient responses, it can be concluded that miniscrew could be an acceptable option in orthodontic treatments. Dental anxiety and fear can be a significant barrier to dental care, with symptoms ranging from feelings of unease to avoidance of care. The management of anxious patients is essential to improve their oral health. Triggers include sights, sounds, sensations, and smells of the equipment used in restorative procedures, and management should focus on controlling these factors. Recommendations for controlling these triggers include distraction and pharmacological interventions. In medicine, distractions include animal-assisted therapy, which proves an effective means of reducing anxiety levels. Studies have shown that interactions with live animals reduce self-reported anxiety more than distractions by either humans or magazines. The media also addresses the valuable role of emotional support by animals in boosting health and enhancing lives. In the past year, numerous news stories have reported regarding the use of certified therapy by dogs to comfort anxious patients in dental practices across the United States. Dogs serve to distract patients, drawing their focus away from dentistry, and generate a positive energy that enliven both the staff and the patients. The positive impact that therapy dogs have had on patients' dental experiences cannot be overstated. The incorporation of pet anti-anxiety therapy is a safe, effective, and inexpensive approach to easing dental anxiety and has profound potential for improving oral health.